Dyson has really revolutionized the cordless stick vacuum industry. Their V series models offer tremendous cleaning ability and much longer run time than homeowners were used to. This is due to the latest lithium ion battery technology powering the suction for upwards of 40 minutes at a time on their popular V8 vacuums. This was category leading and a big reason why their V6, V7, and V8 were among the best selling cord-free models you can find. 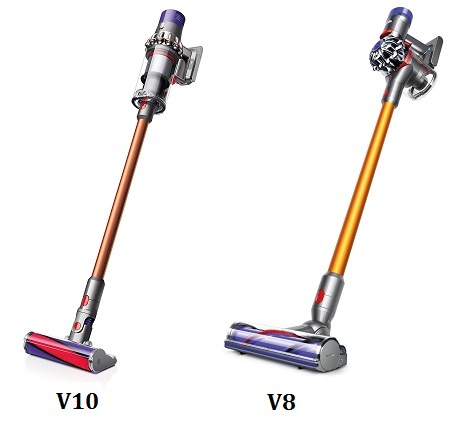 In typical Dyson fashion they decided to raise the bar even more and release a more powerful, longer running stick vacuum cleaner. 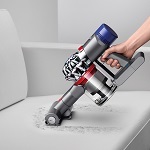 The Dyson V10 Cyclone is their first lightweight cordless model that has similar power to a full sized (corded) upright but with complete portability. It is set to completely transform the way homeowners clean on a regular basis. 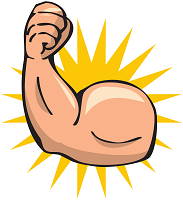 Gone are the days when you have to rely on a big and heavy upright or canister to clean your carpets. That’s right, the V10 is not designed solely for hard floors at all. Let’s do a quick comparison in each category to see how it stacks up to the previous “king of the hill”, the V8. While cord-free vacuum cleaners are not typically known for power Dyson definitely is. The V8 was previously their most powerful cordless with a digital motor that spins as fast as 110,000 RPMs, which is much faster than a race car engine! It has 2 different tiers with 15 of their radial cyclones inside that generate tremendous force as they push the air through, not allowing the dust to settle anywhere. No settling means no clogging, which keeps the power at a maximum level for as long as the battery lasts. The all new V10 digital motor generates the suction power of full sized models (upwards of 150 air watts at the max setting) which obviously makes it the top choice in this category. The head is slightly different so it can take full advantage of the additional torque. It is rated to remove 25% more dust from carpets than the V8 so it is a great choice for any type of floor including carpeting. The extra dust particles being pulled out means you need a bigger collection bin, and the V10 can hold about 40% more. This is a big step forward for cordless vacuums and the main reason why James Dyson himself said this is why he has stopped developing corded models. Both the V8 and V10 lineups have full machine HEPA filtration that is rated to remove 99.97% of the smallest of allergens down to the size of 0.3 microns. These allergens include dust mites, pet dander, mold spores, and even pollen particles that can be brought into your house from the outdoors. These tiny organisms can get into your airways to cause irritation or an allergic reaction which can be quite severe if untreated. And for those who suffer from asthma, these tiny particles can make it much harder to breathe while you are inside since there is very little ventilation. Dyson has made sure their higher end vacuums like these two will remove virtually all allergens from all surfaces they come in contact with. Plus their dust bins have hygienic emptying which means none of the dirt or dust will touch your skin when you empty them. They both come with highly advanced lithium ion batteries with the V10 having one more cell (total of 7) than the V8 which they claim gives a longer runtime. The V8 has a fairly accurate rating of 40 minutes on normal power output which is enough to clean several rooms. Dyson states that the V10 can run as long as 60 minutes but that is on a very low power setting. Since it puts out so much power it tends to use up the battery juice much quicker. This is probably something they will have to improve on if they want to promote it as a whole household cleaning machine, or one that will replace your upright or canister vacuum cleaner. Lithium is the best technology available today and it is good to see a company like Dyson embracing these batteries on their entire cordless lineup. One of the biggest advantages to these lightweight stick vacuums is their versatility. Not only can you use them all over your home, without worrying about a tangled cord but you can also operate them in handheld mode. Simply remove the extension wand and attach any number of tools for vacuuming crevices, furniture, bedding, curtains, or any surface you can imagine. The mini motorized attachment is a good example of these tools as it will remove stubborn pet hair from upholstery or stir up dirt from stair carpeting. When you can operate your vacuum in a variety of configurations it gives you the flexibility you need to remove unwanted dirt from everywhere in your home, not just the floors. Both the V8 and V10 can be used in hand-held mode. The V8 currently has only one model available, the Absolute. It comes with a Direct Drive Motorhead attachment for cleaning carpets as well as a soft roller for hard floors. You also get a couple of attachments including their quick release crevice tool and mini motorized tool that spins the brushes. With 2 tiers of radial cyclones (15 total) and a washable filter there is almost no place for dust to collect. It was previously their most powerful and longest running stick vac but that title now goes to the next model listed below. Click here for current pricing of the V8 at our recommended supplier. The V10 Cyclone is the top offering in their lineup and comes available in three different models: the Absolute, the Animal, and Motorhead. The Absolute has all the same features as the V8 listed above but with more power and longer lasting batteries. Plus you get three different power modes so you can set it from low to max power to suit your needs. The Animal is built for homes with one or more pets. It comes with a lot of the same features as the Absolute minus the soft roller head. If you need to clean hair from carpets on a regular basis, without worrying about smooth surface cleaning, then the Animal makes a lot of sense. The V10 Motorhead is their most affordable option as it also is lacking their soft roller head. In addition to that their is no mini motorized tool for pulling hair and other embedded particles from upholstery. You just get the Direct Drive cleaner head and basic attachments. When deciding on which V10 is the best choice it all comes down to which heads and tools you need, or basically which surfaces you will be vacuuming on a regular basis. Click here to compare the V10 models and check current online pricing. Plus you can read consumer reviews to get a better idea as to how each model performs.